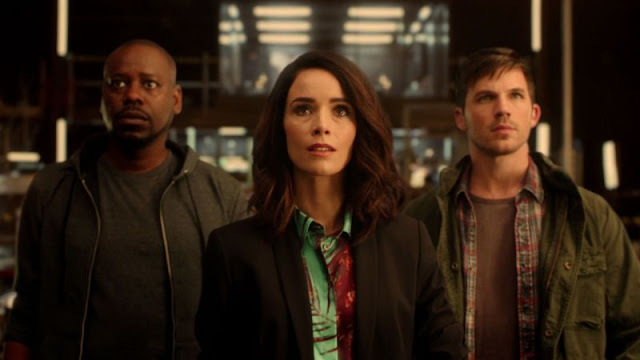 The fight to save "Timeless" resulted in a two-hour series finale. The series will wrap-up with the two-part finale on Thursday, December 20 from 8:00 p.m. - 10 p.m.
"Timeless" executive producers Eric Kripke, Shawn Ryan and Arika Lisanne Mittman are promising fans an epic, unforgettable thrill ride through the past, present and future, with a healthy dose of Christmas spirit. Spread across three centuries and two continents, the finale will test Lucy, Wyatt and the entire Time Team like never before as they try to #SaveRufus, preserve history and put a stop to Rittenhouse once and for all. The cast includes Abigail Spencer, Matt Lanter, Malcolm Barrett, Goran Višnjic, Paterson Joseph, Sakina Jaffrey, and Claudia Doumit.